Lourdes is an eighty-year old woman who has accumulated an incredible amount of spiritual knowledge. Her spiritual mediumship, according to her recollection, commenced at a very young age. Although her spiritual journey has been extremely fulfilling, it has not been easy. This is her story. "My spiritual awakening commenced when I was approximately four years old. I recall my mother coming to my room, wishing me a good night and turning the lights off. Suddenly, I would see beautiful colored lights moving above me. Every night, they would come and keep me company until I felt asleep. I was not afraid. I was so young and naïve that I thought it was a normal event. Therefore, I never told my mother. I was four years old when I attended my first velada-spiritual gathering. I sat quietly on my mother’s lap observing everything around me. Although I did not understand what was happening, I was not scared. Instead, the spiritual mediums' actions enthralled me. In my early adolescent years, I had many spiritual experiences such as astral travel. However, I can’t recall specific details. I was eleven years old when I had a mind-blowing dream. The dream took place in a distant land. I believe it was India or a similar place. I was a female beggar dressed in filthy rags. Prior to being an outcast, I was the wife of a wealthy man. Due to a wrongful act, committed by me, I was banished from my home and forced to live a life of poverty. Begging for something to eat, I noticed a festival nearby. Suddenly, a man on an elephant appeared. It was my husband. I ran to him and asked for forgiveness. He came down from the elephant and approached me. With immense anger and hate in his eyes, he pushed me to the ground. End of dream. The dream was so meaningful. It gave rise to the concept of past lives, and foretold of future events. Later, I would meet the man from my dream, and he would become my husband. A year later, I was attending a party when a man walked in. He was approximately 18 years old and a replica of the man from my dream. I could not believe my eyes. Since I was too young, nothing happened between us. I was fifteen years old, when we met again. He had been married and divorced. He was the older and handsome man that young girls dream of meeting. We started going out. I was very much in love. I was so disappointed when I left the apartment. I wanted to hear her say, ‘He is great and wonderful. And, you will live happily ever after.’ Just like in the fairy tales. However, I got the opposite. In time, her words would become a reality. I was not Cinderella, and he was not my prince charming. Instead of heeding to the woman’s advice, I got married. I was sixteen years old. By the age of seventeen, I was the mother of a baby girl. Two years later, I gave birth to another daughter. The union lasted four years. The relationship was a love/hate situation- love on my side and hate on his. Similar to the dream, I felt I was being punished. However, I did not know the why. It seemed he detested me without cause. Amidst all the turmoil in my life, I managed to attend spiritual gatherings. I was in so much need of spiritual guidance and comfort, and the gatherings provided that and much more. I was seventeen when spirit came through me. I was at a spiritual gathering at my mother’s house. At the commencement of the session, I felt an unsettling sensation inside me. The sensation was like no other. It was all new to me. As the session continued, the sensation kept intensifying. My body kept vibrating in an uncontrollable manner. It was spirit taking over my body. 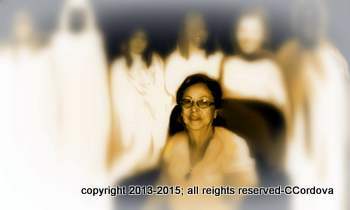 A spirit medium, whom was at the gathering and had much spiritual experience, began assisting me. In a short time, the spirit energy came through me and began speaking. Throughout the process, I was in a semi-conscious state remembering very little. It was a very powerful experience. From that day, I began connecting with my spirit guides. On several occasions, I would sit down, with paper and pencil, and draw. 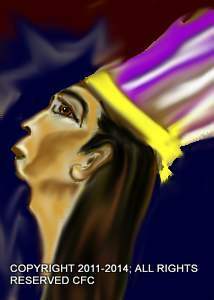 The majority of the drawings were of my spirit guides. In addition, I would write messages from spirits. Whenever they directed me to write or draw, immense spirit energy would travel all over my body, especially my hand. The more I engaged in spiritual work and attended spiritual gatherings, the more connected to spirits I became. I continued working with my spirit guides for several years. Although I was experiencing many problems, I remained faithful to my guides. I remarried with the disapproval of my guides. The marriage did not last long. I became a widow. After a few years, I met and married a wonderful man. He was the love of my life. Prior to the marriage, my departed grandmother came to me in a dream. She warned me not to get marry. Paying no heed to the warning, I got married. Even though my husband and his family were believers of spirits, I began pulling away from spiritism. I no longer wanted to be a part of it. At times, they would gather and conduct spiritual sessions. Although I was always invited, I refused to attend. The spirit world was no longer a part of my life. To this very day, I cannot understand the reasons behind my actions. Perhaps, I felt I had attained happiness and needed nothing else. I don’t real know. Even though my husband was a good loving man, my story did not have a happy everlasting ending. After a few years, he developed cancer and died. Throughout the many tragedies in my life, I always had the spiritual fortitude needed to move on. However, when my last husband passed away, I felt completely lonely. I no longer felt the spirit energy around me. I felt an immense inner emptiness. After the death of my husband, my life began to take a drastic turn. I became entangled in a web of loneliness and despair. Although my youngest daughter became my savior, she too died unexpectedly. I tried desperately to connect with my spirit guides, but to no avail. I felt they had abandoned me. I felt, saw or heard nothing. I was paying the price for rejecting them. After many years, I have finally been blessed once again. I have begun to connect with my spirit guides. Although it is not the same as before, I am grateful to God for a second chance. I wasted so much time. My biggest error in life was to reject my mediumship. I did a foolish thing and paid a heavy penalty. Could my life have turned out differently if I continued with my spiritual mission? I don’t know. What I do know is that my cross would have been lightly to carry with the help of my spirit guides. For those on a spiritual path, remain firm. Don’t commit the same mistakes I made. Seek spiritual assistance; attend spiritual gatherings to attain spiritual enlightenment; and be faithful to God and spirit guides. Remember, the road to spirit mediumship is not easy. It is a slow process, which requires much patience and faith. The key is not to give up. At the end, you will be grateful that you kept it going.